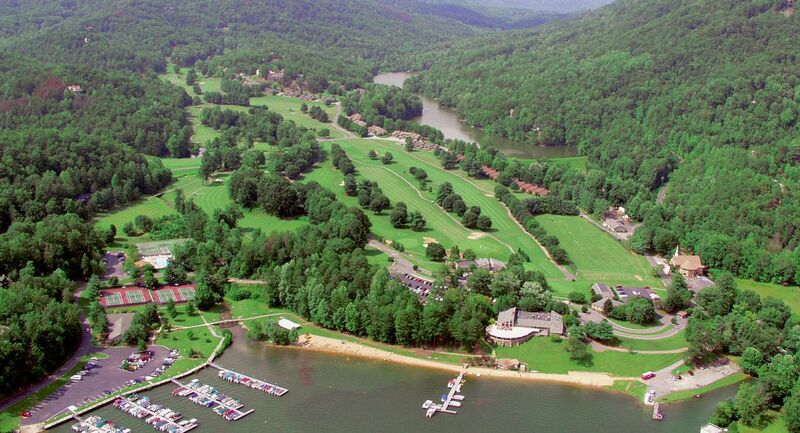 Our Blue Ridge Mountains are known for many adventures and relaxing places, and they're within easy reach when you stay at Rumbling Bald Resort on Lake Lure. Visitors come to North Carolina's Blue Ridge Mountains year-round for their many outdoor adventures and chances to unwind. Unforgettable experiences are within easy reach when you make Rumbling Bald Resort the centerpiece of your vacation. You’ll feel at home in any of the resort’s 200 accommodations, which range from cozy studios for two to roomy homes for large groups or families. Plus, many are pet-friendly and have kitchens. If you don’t want to cook, the resort has four dining options. The Gardens serves spectacular surroundings with its seafood, pasta and steak dishes. Don’t pass on its weekly prime rib buffet or molten lava chocolate cakes. Legends on the Lake is perfect for a casual meal, whether pizza and wings or breakfast. You’ll find plenty to do at the 2,900-acre Rumbling Bald Resort. Tee up at its two championship golf courses. Enjoy the view of Bald Mountain from the 11th hole of Apple Valley, named one of the most beautiful mountain courses by Golf Digest’s Places to Play. Navigate narrow fairways to reach Bald Mountain’s small greens, where putts always break toward the mountain. Scenes for Dirty Dancing were filmed at its 16th hole. Choose from salon services, skin and nail care, and massages at the resort’s spa. Can’t pick one? Try the Spa Sampler: an express facial, Swedish massage and your choice of treatment. The spa, along with an indoor pool, whirlpool, sauna and steam rooms, is located in the Wellness Center. Outside its doors are four lighted tennis courts. Bring your racquet, or take a swing at pickleball, which is a mashup of tennis, badminton and table tennis, where you and up to three more players use paddles to bat something akin to a wiffle ball over a net. Follow West Lake Road to the opposite end of the resort, where you’ll find access to the Buffalo Creek Park Trail System. Mountain bike or hike its 5 miles of trails, showcasing Hickory Nut Gorge’s rock outcrops, waterfalls and other beautiful sights. Cool off after your hike in the resort’s two outdoor pools or with a float down the lazy river. The pristine waters of Lake Lure are perfect for swimming. The resort’s private sandy beach is open daily and offers a defined swimming area and lounge chairs. Rent a pontoon boat, kayak or canoe, or stand-up paddleboard and head out onto the waves, where you also can fish for big bass and colorful trout. Lake Lure Flowering Bridge crosses the Rocky Broad River, Lake Lure’s main tributary. The 155-foot bridge is nearly 100 years old and was retired in 2011, when an adjacent replacement was built. Enjoy the fruits of this all-volunteer effort by wandering through the different flower beds, including one dedicated to the state wildflower of the year. It’s open year-round and hosts special events. 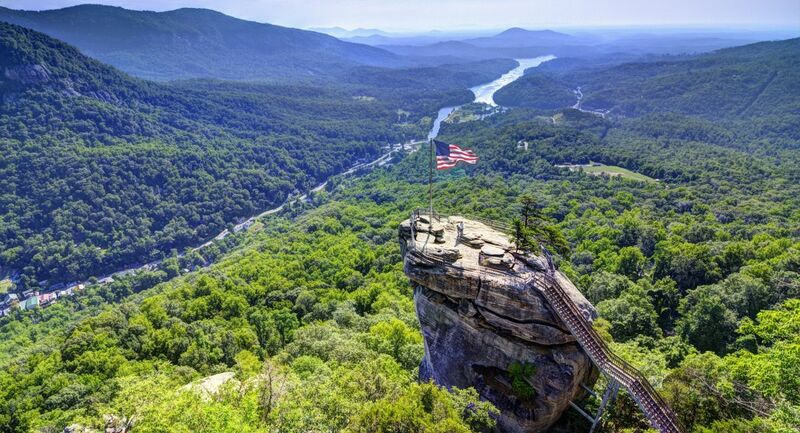 Chimney Rock State Park is a jewel that’s minutes from the resort. Take the elevator or climb the 499 steps to the top of Chimney Rock – the park’s namesake monolith – for views that stretch 75 miles. Below you’ll find restaurants, picnic areas and an easy hike to the base of Hickory Nut Falls, the second-highest in the East. Pan for gold and gemstones at Chimney Rock Gem Mine in the nearby village. You’re guaranteed to find a treasure, and more are available in the store, including jewelry and rocks and minerals from around the world. You may uncover some courage when you sail through the forest on Canopy Ridge Farm’s 90-minute zip line tour. TripAdvisor.com reviewers ranked it the No. 1 Lake Lure activity. There are several zip lines, including the speedy 1,000-foot Zip Zilla, and kayak tours. If you prefer feet on the ground, try horseback riding. Riverside Riding Stables’ three trails offer options for riders as young as 2 years old. Its 2-hour ride takes you through a river and over a mountain trail. Family-owned Cedar Creek Stables offers three trails, too. Overlook is its most popular and winds along a mountain ridge. Several wineries – Russian Chapel Hills, Mountain Brook Vineyards, Overmountain Vineyards and Parker Binns Vineyard – are tucked in the foothills and mountains that surround the resort. Their operators love explaining the wine-making process and pouring tastes. If you’d like more of a learning experience, reserve a spot on the resort’s weekly tour, which visits three wineries and includes lunch. 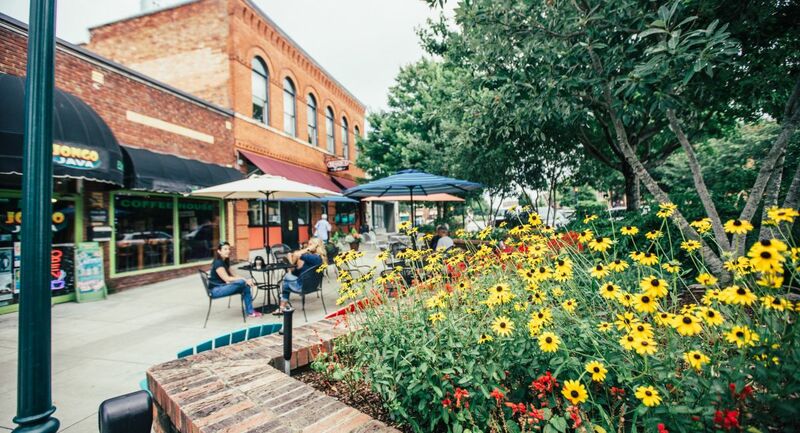 Historic downtown Hendersonville is off Interstate 26 and a short drive from the resort. Stroll 16 blocks of galleries, restaurants and 120 unique stores, including the venerable Mast General Store and its candy-filled barrels. Hendersonville is also home to the North Carolina Apple Festival, which is held over Labor Day weekend. Continue north to George Vanderbilt’s 250-room Biltmore in Asheville. The self-guided tour takes you back a century, explaining life and work at the country’s largest private home and its acres of manicured gardens. Afterward, cruise the Blue Ridge Parkway to Milepost 305 and Grandfather Mountain. Explore the wildlife exhibits, nature museum, hiking trails and picnic areas there before crossing the Mile High Swinging Bridge. This article was produced in partnership with Rumbling Bald Resort.